Espumisan L is the cure for swelling and a feeling of heaviness in the abdomen. Enhanced formation and accumulation of gas in the stomach and intestines in the form of small bubbles foam leads to unpleasant symptoms such as bloating and feeling of heaviness in the abdomen. This is the reason for colic in infants, which are common complaints encountered in about one third of infants. Colic begins several days after birth and continue until about the third month. They are located both in infants fed with breast milk, and in those fed with formula. Colic usually starts at the same time of day, usually in the afternoon and evening, with a sudden, intense, prolonged crying. Espumisan L reduces the surface tension of gas bubbles break and retail bubble foam. Released this way gas can be absorbed by the intestinal wall. Espumisan L acts in a purely physical way, does not change the chemical reactions and is pharmacologically and physiologically inactive, does not interact with microorganisms and enzymes. Espumisan L does not affect digestion and does not change the acidity in the stomach. Espumisan L is not absorbed and is excreted unchanged. 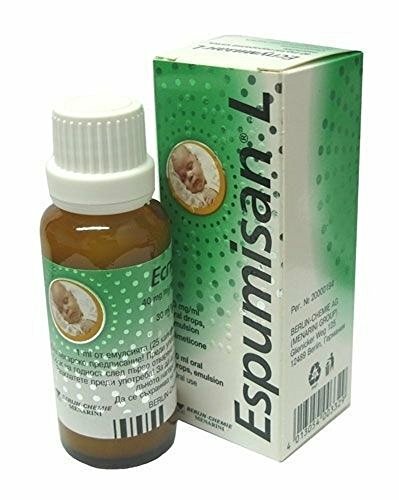 INFANTS 1 ml (equivalent to 25 drops) Espumisan L is added to a bottle of milk at each meal or small spoon given to infants before or after each feeding. Children between 1 and 6 years 1 ml (equivalent to 25 drops) Espumisan L, 3 to 5 times daily. Children between 6 and 14 years 1-2 ml (equivalent to 25-50 drops) Espumisan L, 3 to 5 times daily. Adolescents and adults: 2 ml (equivalent to 50 drops) Espumisan L, 3 to 5 times daily. Espumisan L is taken during or after a meal, if necessary, before bedtime. Treatment is determined by the flow of complaints. If necessary, Espumisan L can be taken continuously. View More In Gas Relief. If you have any questions about this product by Berlin-Chemie, contact us by completing and submitting the form below. If you are looking for a specif part number, please include it with your message.